I feel as though I haven't published a beauty favourites post for a while so for today's post I thought I'd share some of the beauty products that I've been loving throughout the months of February and March including: Freshly Cosmetics, Colab, Sond Skincare, Clockface Beauty, White Glo and more. I have found so many fantastic products recently, most of which are new to me but others, such as the Colab dry shampoo, are long term favourites. Let's start with the cleanser I've been using on/off for quite a month or so now and it's the latest cleanser from Freshly Cosmetics. We all know by now just how much I love Freshly Cosmetics and all of their natural products. The cleanser comes gorgeously designed and packaged, it contains plant extracts such as almond oil and aloe vera juice. It claims to deeply cleanse, reduce open pores and moisturise. I love the texture of the cleanser, it feels quite luxe but gentle on the skin and I feel as though it does deeply cleanse my skin but it has never left my dry, sensitive skin anything but comfortable, smooth and clean, which is exactly what I want from a cleanser. I think this cleanser would work for so many skin types and it's definitely worth trying! 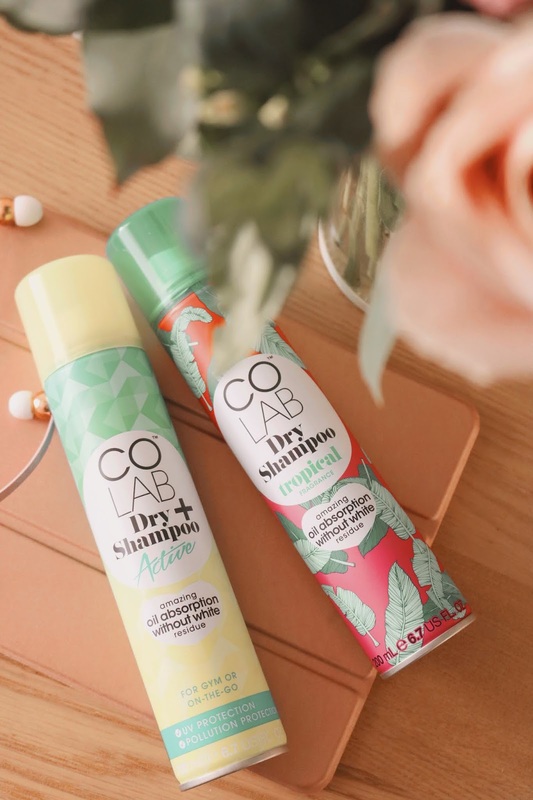 A few weeks ago, I was contacted by the lovely people at Colab about receiving a little gift and not long after, I received a package with two bottles of the amazing Colab dry shampoo within it! I have been buying and using the Colab dry shampoo range for years, pretty much since it was released so it's definitely a long time favourite of mine. Before discovering the Colab dry shampoo, I'd tried so many including the very popular Batiste dry shampoo but none of them worked for my hair! I don't know why none of them worked but thankfully the Colab dry shampoo is fantastic and I couldn't be without it. I always have at least two bottles in my haircare drawer so I don't run out as if that happened then I'd be stuck with less than acceptable hair. If you still haven't found the dry shampoo for you then definitely try any of the Colab dry shampoo options as they work SO well for me! 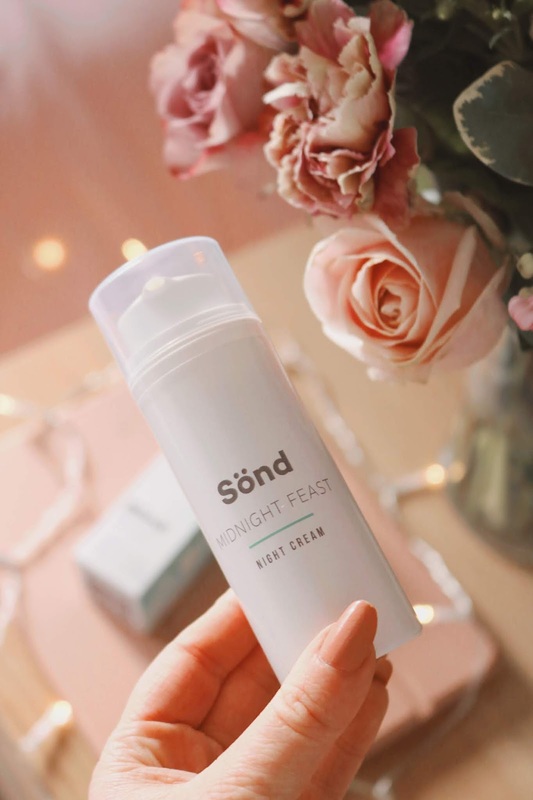 One of my favourite skincare products from the past few weeks has to be the very nourishing Sond Skincare Midnight Feast Cream which contains organic argan, coconut and hemp seed oil as well as sunflower oil and olive oil. This is the first product I've tried from Sond Skincare and to be honest, I'm very impressed! From the packaging design to the product itself, I'm loving it. I love the pump dispenser which makes it very handy, the lovely natural ingredients and the gentle but effective formula. It's specifically designed for those with sensitive skin and skin conditions such as eczema, which is what I've had for over ten years. The cream has a very rich, thick and nourishing consistency that leaves my skin feeling deeply moisturised, smooth and soft - the perfect night cream. My final makeup related favourite is one of my newest favourites but it's instantly become an integral part of my makeup routine and it is a product I've wanted to try for a while! It's the 'blendup vibra-sonic' makeup blending brush from the lovely people over at Magnitone. I've been lucky enough to work with Magnitone a couple of times previously reviewing their cleansing cloths (which I use every single day) and the fantastic XOXO cleansing device, both of which I cannot recommend enough. 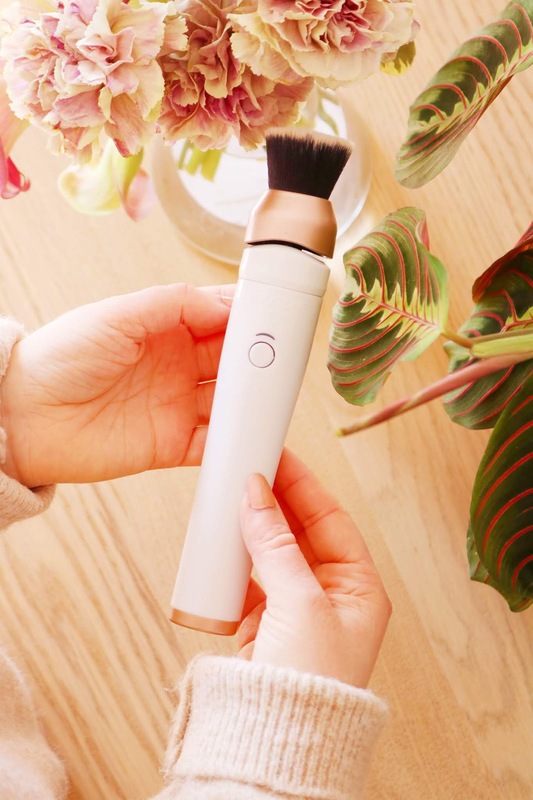 With over 200 movements per minute, the brush vibrates to blend your base products effortlessly to give an airbrushed look. 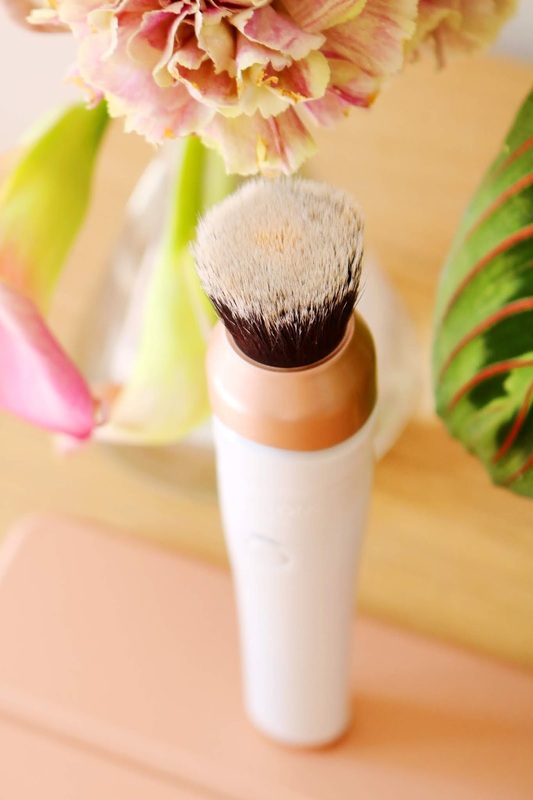 Firstly, I love the appearance of the brush, the bristles are very soft and while it felt strange initially, it is actually a lovely tool to use as it almost gives you a mini facial massage while you're applying your makeup. It has two settings, meaning two speeds but I just use the first and slower speed for applying my BB creams. Personally, I don't think two speed options is necessary. I've only used it with my IT Cosmetics CC Cream and my Holika Holika Moisturising BB cream so far but it's working well and I love using it. Naturally the brush is heavier than 'normal' makeup brushes but that doesn't bother me. Sadly, it's a little noisy...but to be honest, that is my only complaint of the brush so far. The noise might be a deal breaker for some but it's not too bad, in my opinion. Overall, the positives of this brush definitely outweigh the negatives! I love how quickly and easily it blends my BB creams and CC creams. It is fuss free to use, I like the design and I think it will be incredibly quick to clean as it has a self cleaning mode! Out of all the Magnitone products I've tried, I have been impressed with all of them and this one is no different. 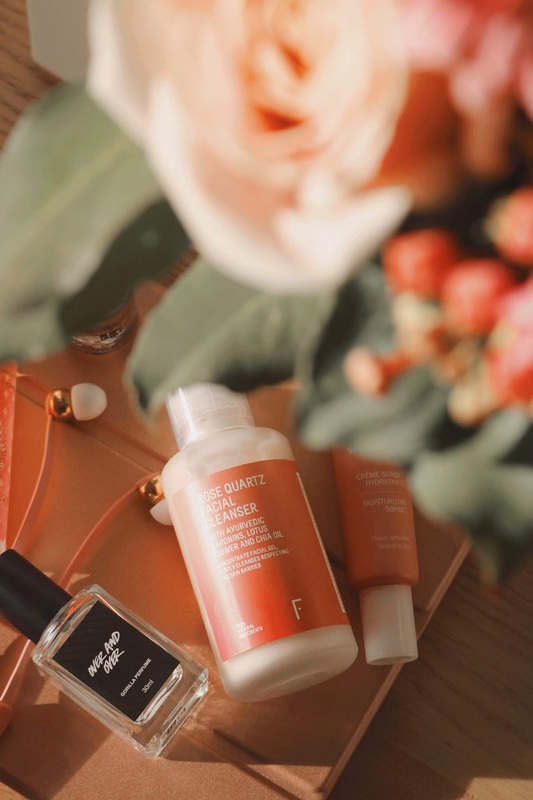 Clockface is a brand I've tried a couple of products from previously and I've loved them so I was excited to try their new cleansing balm which is natural, organic and suitable for vegans. The cleansing balm contains chamomile, eucalyptus, coconut oil, vitamin E, avocado butter and many other fantastic natural ingredients. As with all Clockface products, I adore the packaging! The cleansing balm has such a lovely 'green' scent to it and while the texture in the tub is very solid, it instantly becomes very oily, rich and luxurious on the skin. It definitely feels like a nourishing and luxurious cleansing balm so it's perfect for my dry and sensitive skin. It leaves my skin feeling very smooth, soft and moisturised without irritating my skin (although since the start of the year and becoming fully vegan, my eczema has almost gone!). If you are looking for a natural and vegan cleansing balm that is effective but also very gentle and indulgent, I cannot recommend this cleanser enough. 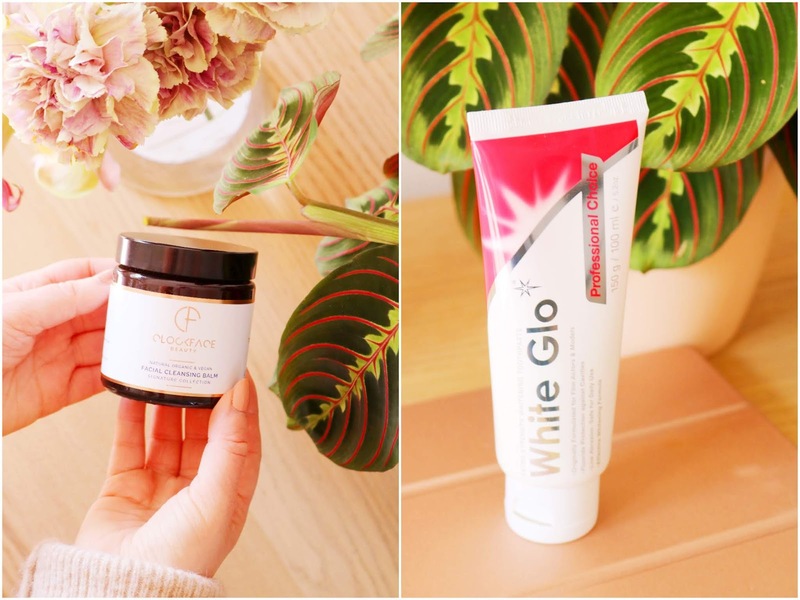 I've tried so many whitening kits and toothpastes over the past few years and very few of them have been effective but thankfully I do occasionally stumble across one or two that work well for me and this inexpensive option from White Glo is the one. It's very inexpensive and the one I have came with a free toothbrush too! Although I've been using the toothpaste with my regular electric toothbrush. It claims to safely whiten, protect from cavities and lightens discolouration, the latter point is the one I was most interested in as I do drink coffee everyday which takes it's toll on my teeth sadly. But I'm not going to give up caffeine so I'm very glad that this toothpaste is as effective as it is. Life has been a little busy and anxious recently and this may sound a little ridiculous but I was using this product daily for a couple of weeks without remembering that it's a whitening toothpaste and a few days ago, when trying on a new lipstick shade, I realised that my teeth were a little whiter! The change isn't massive but it is definitely noticeable so for that reason I cannot recommend it enough, especially because it is also very cheap and seems to be very gentle. Have you tried any of these products? Which products have you been loving recently? Colab Dry Shampoos are my absolute favourite. The packaging is adorable and they smell amazing. I've always wanted to try Colab, I need to pick some up!! I always pick up Batiste as a force of habit but I hate the build up I get after using it just one time! I love the idea of that sonic makeup brush! It would be amazing to put on a hydrating primer and then your foundation. I bet it feels amazing on your skin. I absolutely love Freshly! Their products are amazing! I really need to retry colab, I didn't get along with it the first time but I need to give it a proper go! I love a good cleansing balm, it is such a calming ritual for me! I've never even heard of an electric makeup brush!! I need to investigate! The night cream looks great. My skin is so dehydrated at the moment. I need something to help.